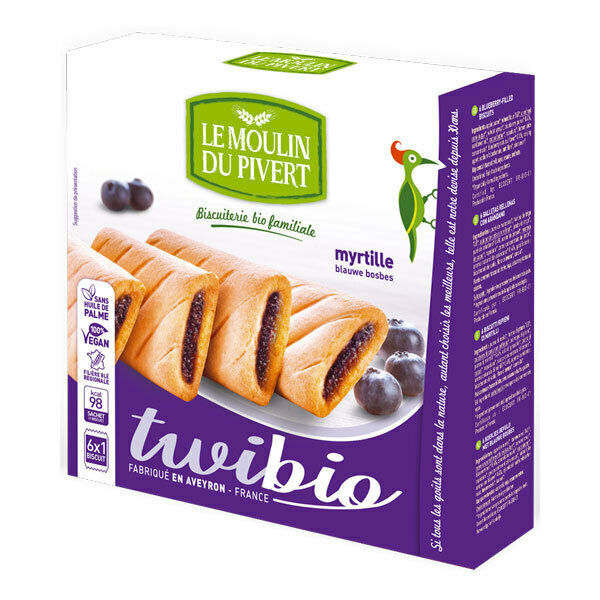 What more delicious than blueberry biscuits made in France without GMO? 6 individual packs so the biscuits stay fresh! Ingredients: * 40% Forage fruit (apple puree *, unrefined cane sugar *, wheat syrup *, mashed blueberries * 20%, concentrated lemon juice *, natural flavor *), wheat flour T65 *, sugar unrefined cane *, sunflower oil *, wheat syrup *, cocoa butter *, * rapadura, baking powder: sodium bicarbonate, lemon juice *, cinnamon *.